A Library Journal Best Book of 2013! A Booklist Best Crime Novel of 2013! Portraying characters so well and so thoroughly, examining and explaining their motives even for murder, requires a level of skill that is rare, marking this as an astonishingly accomplished debut and Mason as a writer to watch very closely. "Jamie Mason wields a pen that magically blends beautiful prose with unrelenting thrills. Each page delivers something new and fresh; in her hands, even the mundane becomes extraordinary. Grab a chair with a comfortable edge, because Mason will keep you poised there until the final page." Mason’s quirky debut novel deftly weaves dark humor into a plot that’s as complicated as a jigsaw puzzle but more fun to put together...Mason’s written a dandy of a first outing with not a single boring moment. Mason strides confidently into Coen brothers territory with her highly entertaining, solidly plotted debut about loneliness and the need for companionship... With sly wit Mason tweaks genre clichés while respecting crime fiction tenets. An extraordinary debut novel that ensnares the reader in its web of suspense and ratchets up the anxiety with each chapter...Three Graves Full is deep and dark, yet funny, a refreshing combination that snags the reader like a grappling hook—destined to become a success. 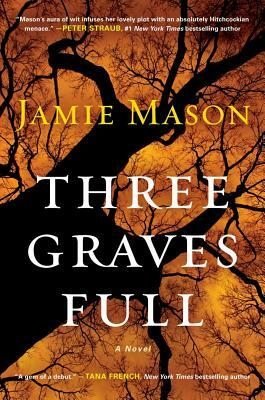 Filled with biting wit and great prose style, Three Graves Full by newcomer Jamie Mason may be the debut of the year. Mason's prose is at times as lovely as poetry, and wry humor deftly offsets her grim tale to devastating effect. This tale has more twists than a corkscrew and you'll find yourself surprised at nearly every turn... Mason has written a quirky and downright thrilling treat that is not to be missed. Not simply a great debut novel or a noble first effort; it is purely a wonderful book from beginning to end.... Pitch-perfect pacing, unforgettable descriptions, and quirky but realistic characters abound from page to page. It is a perfect one-sit read, not because there aren’t places where you can comfortably stop, but because you simply will want to keep forging ahead... Take the hint and read it. "A delightful frolic in a mysterious and unpredictable tour de force of horrific efforts by a debut author. When it gets really weird, it is like quicksand, sucking you deeper. Peppered with delightful asides that made me chuckle, no good deed goes unpunished. Great twists and turns that will keep you on the edge of your seat until the very last page. " "...slick, fast-paced and moves to it’s conclusion with an inevitably that appears unstoppable." "A grieving fiancé, a vindictive murderer and a police detective who won’t accept simple answers drive a tale of blunders, violence and, remarkably, something like justice."